Hey beauties! Today's look is super comfy! My sister had strep and I unfortunately woke up with it this morning... yayyyy.. But, I thought getting out of the house and getting some fresh air would help. We did a little shopping and snapped some photos for me to share! Read below for details on where I got my look! (This is perfect for those days you don't feel well, but don't want to look like a bum because you got things to do). Top: Urban Outfitters (brand Kimchi Blue)! Check out these 1, 2 3! Bottoms: Calvin Klein Leggings (SO SO comfy) Shop them here! 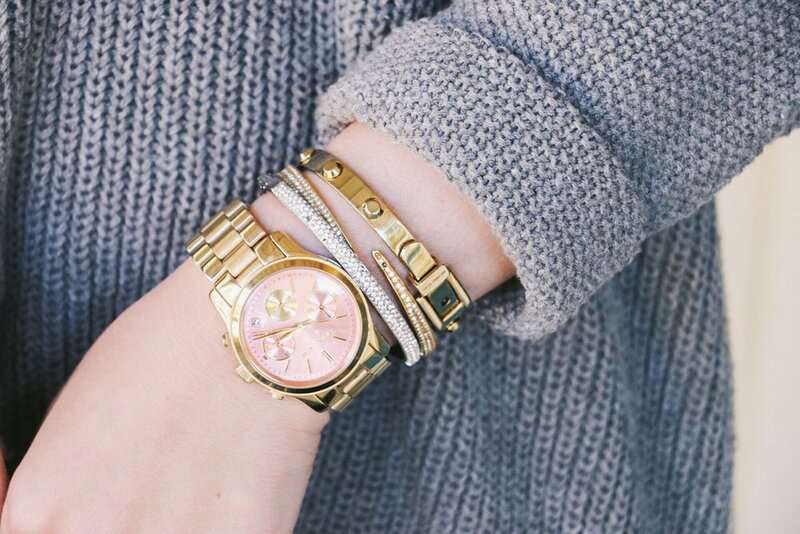 Watch: Michael Kors I love mine! The pale pink goes with almost anything! Bracelets: Mine are from Michael Kors. But check out these amazing bracelets! Handbag: Tory Burch. Check out this one and this one! You can't go wrong with a classic black handbag! Earrings: I love my tassel earrings! I always catch myself packing them up for every trip I go on! Shop them here! Sunglasses: Tory Burch! These and these are similar. Thanks for stopping by, I hope you're having a great weekend! I know I'll be sleeping the rest of the day away recovering from strep! Leave comments on fun things you're doing this weekend & what you'd like to see next! I have a fun post planned for next week when I finish trying out my Avatara skin products! Don't forget to hit subscribe to stay up to date on all things That'sSoGold!